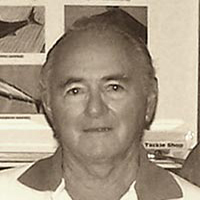 A skilled plumber, Australian Laurie Woodbridge learned the craft of sport fishing serving as deckhand for George Bransford. In 1973 Woodbridge acquired Sea Baby II and became one of the most successful captains in Cairns. Multiple tournament wins and multiple black marlin granders were accomplished-- including Morton May’s 1,347-pound catch which is still the 80-pound line class world record.